Just a not-so-subtle reminder, that when Chase contacts you, either by email, letter, or phone, to warn you that you will be at risk if you don’t sign up for overdraft protection, JUST SAY NO! The only ones that win when consumers have debit-card overdraft protection are banks, to the tune of $38 Billion industry-wide per year. If you don’t have it, you pay nothing as when you try to use your debit card and have no funds, it won’t work (which is how most people think it is supposed to work). If you don’t believe me, just listen to a bunch of consumers groups say the same thing. We all know that Chase has been slashing and burning its customer base, especially among small-business customers, who often finance their operations in the short term with credit cards. Well, Chase is showing again that rather than being a community bank that is committed to fair and reasonable lending practices, it is only looking to cherry-pick the creme of the crop of customers. At least, that is how Bloomberg Business Week sees it. Their latest volley, a seemingly innocuous promotion that offers companies a reduction in interest rate on credit lines for hiring new employees. Business Week thinks they are trying to attract the best strong (financially speaking) customers from other banks. I read it a little differently. Perhaps they are trying to identify which of their current customers they want to hold onto, or conversely, which additional customers they will motivate to leave them. The definitely NSFW video (profanity) represents what it is like to work for Chase bank. Most interesting though, are all the comments that go along with the video on YouTube and financemoz.com, which appear to mostly be from current and former Chase employees that definitely don’t like it there. Chase trends – where have the customers gone? 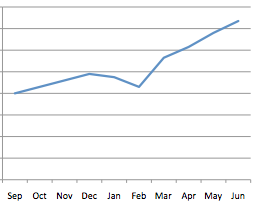 Take a look at the graph of average daily visits of our site for the last 10 months. This would seem to indicate that more people, not less, are looking for information on problems and difficulties with Chase. When it comes to posting Chase-related stories and information on this blog, I don’t exactly go out of my way to find them; I post what people send me or what Google Alerts finds for me. Now look at the trend in posts over the last 10 months. Holy cow! 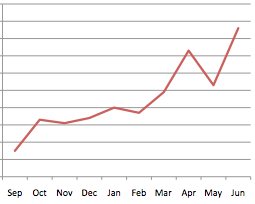 That is about a five fold increase in posts per month. Clearly, more and more people are posting their dissatisfaction with Chase online. I realize this information is very anecdotal and could mean different things. When reported incidents of disease go up, you have to ask, is the disease spreading, or are just a higher percentage of people reporting being sick? This could mean that Chase is getting worse, or that Chase has been bad enough for long enough that more people are reaching that boiling point where they want to do something about it. What about number of retail banking customers? That would surely be a good indicator of whether people are leaving Chase. Well, Chase doesn’t make those numbers available, but they do make their total deposit numbers available. Hmm. Ok, well that seems to be yet another trend for Chase in the wrong direction. Either all Chase customers have become 8.3% poorer over that 15 month period, or Chase clearly lost some customers. 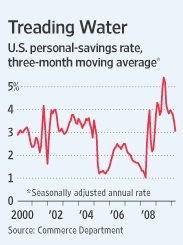 Let’s take a look at the US savings rate and household net worth over that period. Sorry Chase, not only has the personal savings rate been very high during that period, but household net worth went up 6%, even as housing prices went down, meaning personal savings probably went up considerably more than 6%. And with lots of individual investors sitting out of the stock market in the last couple of years, this can only mean the money is in mattresses or banks. Apparently, it isn’t in Chase bank. So, if we add up a 6% increase in household net worth and an 8% decline in Chase deposits overall, my best guess is that they have lost at least 14% of their depositors. Wow! No wonder they don’t include those figures on their financial statements. 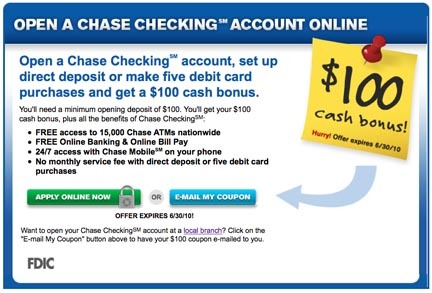 Like Washington Mutual before it, Chase has been offering a $100 bonus for signing up for a new checking account (with minimum deposit of $100, recurring electronic deposit, account must remain open for six months minimum) pretty much forever. So why does their latest campaign say hurry, offer expires 6/30/10? This sounds suspiciously like the rug store down the street with a perpetual going out of business sale. I just came across the website mybanktracker.com which has quite a few Chase reviews. Guess what people think of Chase on that site? We’ve reported a number of times on Yelp reviews for Chase branches, most of which are pretty low, but this is the first countrywide review for Chase bank I’ve seen. Not a very good rating. 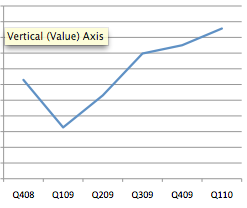 Also shocking is MyBankTracker’s bank health estimation, which is not exactly stellar. Q Chase bank has lost my Social Security direct deposit of $1,189. It does not know where the money is. 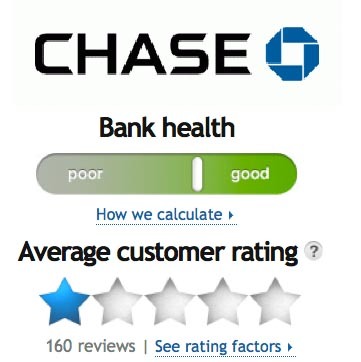 Chase recently bought the California branches from Washington Mutual, so there are probably a few bugs in the system. A There was one, John, and it has been fixed. I sent your e-mail to Chase and they ran it down. The incorrect account number was given to the Social Security Administration because of human error. Chase said that your money is now in your account. Oh, wait, false alarm, it was HUMAN ERROR! I came across a report that Chase is dropping support for newer popular browsers like Chrome and Opera because it claims they aren’t secure enough. Really? Then why do they continue to support Internet Explorer version 6.0 which has MANY well known security problems and is no longer supported by Microsoft? The same reason their instant alert text messages to warn you that your bank account is running out of money comes only once a day and in the middle of the night; Chase just isn’t all that tech savvy.